There are many things I keep around me for perspective, my way of keeping time. I find the passing of technologies interesting, and attempt to understand how the transformations came about, and where they add real value – and where they don’t. 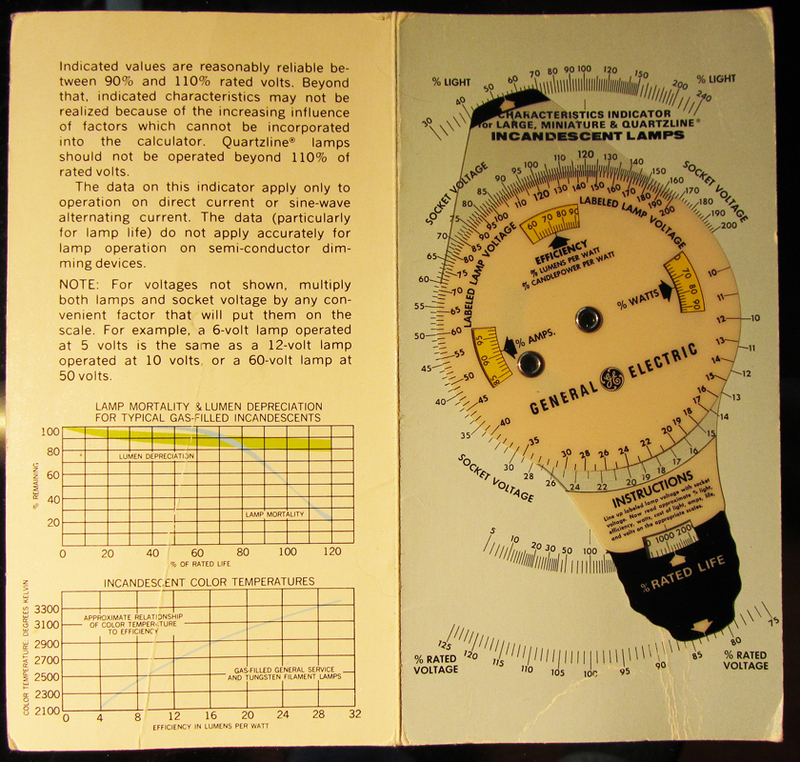 For example, I have this great little carboard calculator issued by GE (dated 1973.) 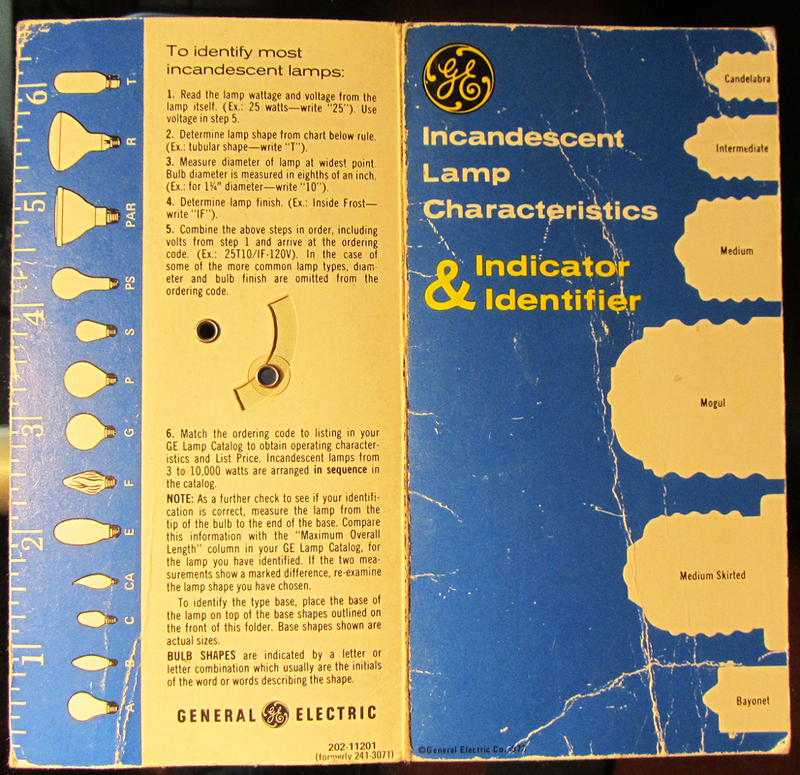 It describes incandescent lamp bases on the front, and shapes on the back, with instructions on identification of lamps by model numbering. Note that there is no reference to the MR16 lamp or base, as this was not yet in the market. Inside this little gem is a calculator that shows the impact of operating voltage on light output, power use and lamp life. I used this in customer presentations for years, as well as calculating dimming effects of light output and lamp longevity. So, today this is nothing more than a relic, a novelty from the past. CFL and now SSL is rapidly putting the lamps involved out of the market, and the government is aligned for the kill shot. 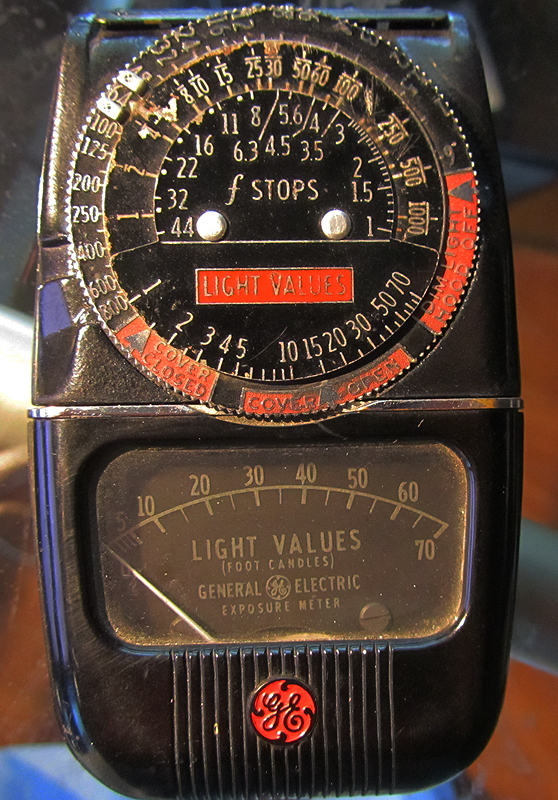 Another item I have in my care is a GE Model DW-48 light meter, this one a 1940 model. It has a dual purpose. It reads footcandles for general illumination use, and provides F stop data for photographers. This was left to me by my father when he passed, and remains a favorite of my lighting instruments. Interestingly, this meter reads LED light levels just fine. Unlike some of the modern meters I have, this meter remains within a 5%+/- range of true readings. I recently purchased an Amprobe LM-200LED meter for a field device after discovering other meters were giving me odd readings. The Amprobe device is really good for the $100 asking price, and provides reading in line with what I see using a full blown sprectroradiometer. So does the DW-48, reading virtually the same as my Amprobe, and with less variability than my Minolta T10M and Testo meters. I also like the deco styling, metal and glass enclosure. However, its not very useful in low light conditions, as the meter face is not illuminated and black, making it more a curiosity than a functional meter for daily use. Besides, if it gets damaged, it would break my heart, since it is more than a meter to me personally. As we rush into the future of lighting, I can’t help but smile at the thought that one day we will look back at what we have in our hands today and feel nostalgic at its crudeness and simplicity. We are heading into a bold new future, that will be obsolete at a rate that will embarrass all prior technologies that have swept through this industry. Just look at one of the original K series LEDs mounted on a star board – it’s got nostalgia written all over it! I have bins full of LEDs, drivers, power supplies and circuit boards that are so far out of date (made just 5 years ago BTW) that I can’t see using them on anything, regardless of their expense. I can get more for so much less today. For the real cynics out there (I be one), I find it truly entertaining when I am exposed to the myopia of techno-philes now in SSL, who actually believe that LEDs are the ultimate end-all to general illumination. The future is not that predictable. We can be certain of but one thing – that there is someone out there today or in the near future, with ideas beyond LEDs as we know them, that will eclipse what we are able to imagine today. so true, for example the induction lighting has a lot to offer…. 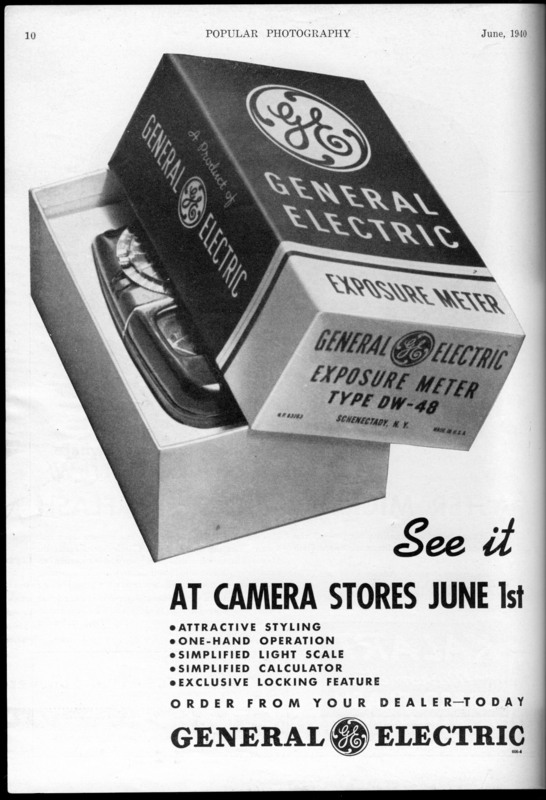 with even graeter MTBF than LED´s.